After an excellent opening weekend, director Laxman Utekar’s Luka Chuppi has reported a steady performance on Monday as well despite a normal working day. Due to positive word of mouth, the movie showed a strong uptrend over the weekend and now all set to emerge next hit of the year. Being the much-anticipated release, Kartik Aaryan and Kriti Sanon in lead roles, Luka Chuppi has got succeed to hit the target right as expected and received mostly positive reviews from the critics as well as the audience across the country. Presented by Maddock Films, this romantic comedy-drama was released with large-scale promotions and got a decent start. On Friday, it did the business of 8.01 crores,. Then on Saturday, the movie took a healthy jump and collected 10.08 crores. On the next day i.e. Sunday, with a further growth, Luka Chuppi raked the business of 14.04 crores and raised its opening weekend total collection to 32.13 crores. Now it has entered on weekdays and still has a strong hold over the audience, especially in metro cities. On Monday due to a holiday, it got an almost similar response as of Friday and minted the amount of 7.90 crores. With this, its 4 days total collection has become 40.03 crores nett from 2100 screens across India. 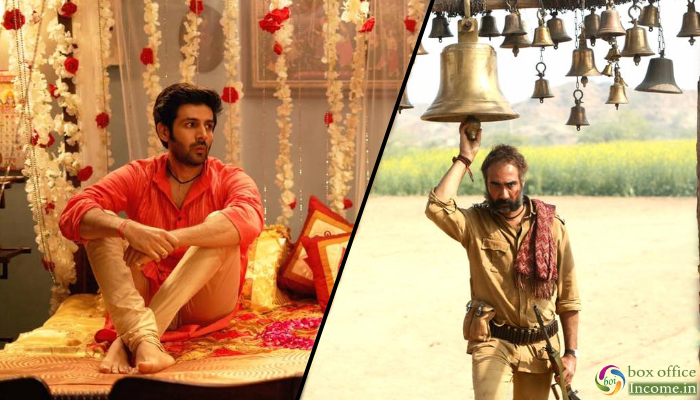 While the adjacent release, Abhishek Chaubey’s Sonchiriya has also received positive reviews from the critics and showed an uptrend over the weekend but still remained overall low. It did the business of 1.20 crore on Friday, 1.50 crores on Saturday & 1.90 crores on Sunday. On Monday, Sushant Singh Rajput, Bhumi Pednekar & Manoj Bajpayee starrer this action-drama has faced drop in footfalls and managed to collect 0.80 crore on Monday to raise its 4 days total collection to 5.40 crores nett from 720 screens across India.